A giant thank you to everyone who entered, judged, attended and presented at the third annual Cynopsis Sports Media Awards Breakfast on Thursday, April 17 at the Yale Club in NYC. A special thank you to Bonnie Bernstein, VP of Content & Brand Development and Host for Campus Insiders for co-hosting the program. An additional thank you not only to all of our judges as well as our presenters: Rick Hendrick, founder of Hendrick Motorsports; NBA TV, CBS and Turner Sports analyst Greg Anthony; NBC Sports’ Premier League host Rebecca Lowe; 120 Sports host Michael Kim; Matt Yallof, co-host of MLB Network’s The Rundown; and FOX Sports’ Kenny Albert. Also, we honored three executives who have changed the way their sports entities connect with fans around the country. Brian France, CEO & Chairman of NASCAR received the Vision Award as Sports Executive of the Year. 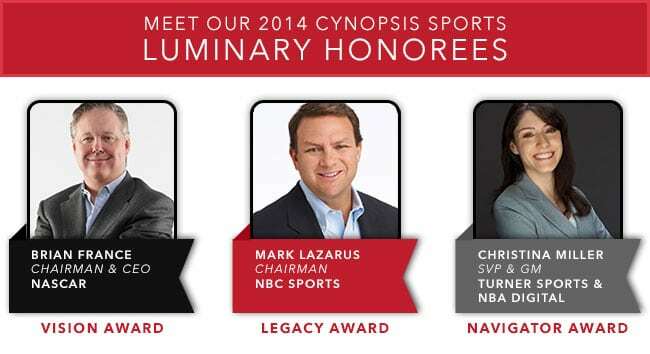 Christina Miller, NBA Digital’s SVP & GM for Turner Sports received the Navigator Award as the Sports Network Executive of the Year, and Mark Lazarus, Chairman of the NBC Sports Group received this year’s Legacy Award. The awards honored outstanding work in the sports media industry over the past year and had categories that included television series, radio and live events as well as digital and marketing campaigns.